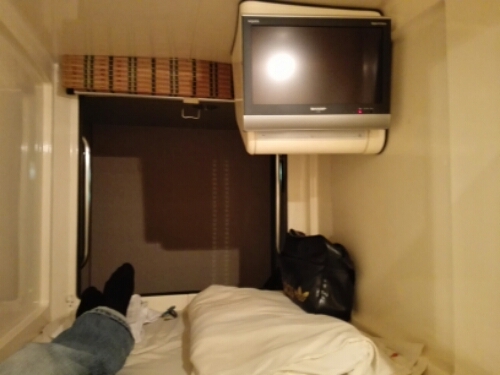 I had heard about capsule hotels in Japan, but hadn’t tried them on my first two trips there. On my third visit I gave them a go, and I found them quite okay. Especially considering their price. Your room is basically a capsule. A bed, nothing else. There is room enough for you to sleep, and to sit up if you are not too tall. The bed is big enough, comfortable, and for your entertainment there is a TV on the wall as well as a radio. 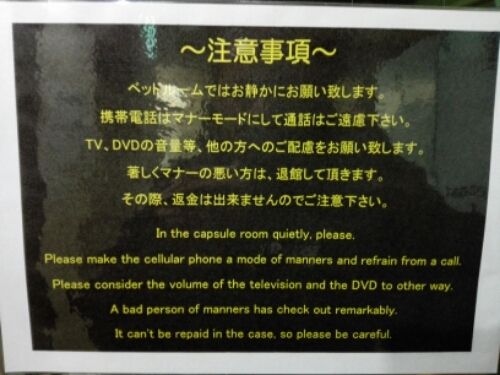 Earphones are provided for your and others convenience. Up to forty capsules may be along the same hallway. One row on top of another. Outside the hallway there are lockers to store valuables in. Most capsule hotels have public baths, Japanese style. You are given a nightrobe and slippers to walk around with in the hotel. You can read more about the Japanese bathing experience in my post about Dogo Onsen. Capsule hotels also have a public area where people can relax. Chairs are provided, there is a TV, vending machines providing drinks and both hot and cold food. Many capsule hotels are male only. For short stays, a night or two, I have found capsule hotels to be all right. I don’t spend much time at the hotel anyway, just for sleeping, the rest of the day I am out. But after a while I find it is nice to have a proper room, a proper bed. A place where I can relax for an hour or two, all by myself, have a bath. A big bed. 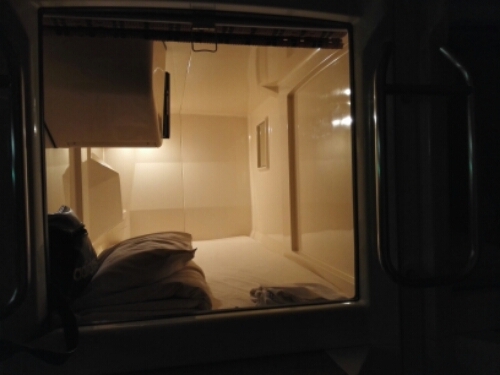 During my four nights in Sapporo at Christmas 2015 I spent the first two nights in a capsule hotel. It was perfectly fine until the last night. Early in the morning, around 5am, two Japanese men started packing, getting ready to leave. They were noisy and used a very long time. It was hard to sleep. It felt nice when I checked into a proper hotel later that day. It was Christmas Eve and for my last two nights in Sapporo I had a hotel room for myself. In many ways, capsule hotels are like private hostels. Hostels without the socialising. Your bunk bed is boxed in, giving you some privacy, and there isn’t really any socialising going on like it often does in hostels. For the price they charge I have found a capsule hotel to be fine for a night or two, saving me some money and giving me just enough comfort. For longer periods I prefer a proper room. Oh wow! This is very interesting but I’m not so sure I could do it! Did you feel claustrophobic at all?